Finally, a cosmetic approach to restore the healthy appearance of a damaged toenail that has become thick, flakey or discolored! In as little as 15 minutes a realistic natural-looking nail can be created for you by our Doctors, who have been specially trained in the KeryFlex Nail Restoration System™. 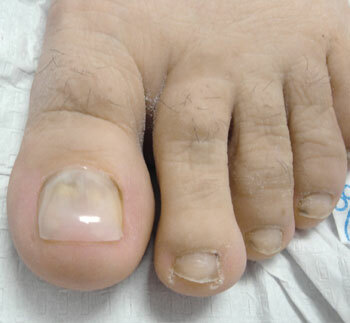 KeryFlex™ uses polymer resins and special activators to create a durable, yet flexible artificial toenail. It is perfect solution for fungal nails, nails damaged from injuries, brittle shaped or splitting nails, and discolored nails. The KeryFlex™ system creates a natural looking nail in a very simple way. First the damaged nail and nail bed are prepared and then coated with the KeryFlex™ bond. Once dried, the KeryFlex™ polymer resin is applied. This is hardened with a specific wavelength of ultraviolet light and then sealed to create a natural looking, flexible nail that is non-porous and non-absorbent. It looks and feels completely natural. Are there any limitations once I have the new nail applied? The new nail is durable and nail polish can be immediately applied on the nail. Wish to change the color of your nail polish? You can even apply nail polish remover to the artificial nail. The nail is durable and individuals can engage in their normal exercise routines after their toenails have been remodeled by KeryFlex™. Why is this only available in a doctor’s office? Since the KeryFlex™ system is applied over a deformed or damaged nail, it will be necessary to have a portion of the damaged nail removed (done without pain), which cannot be done in a nail salon. The KeryFlex™ nail does not irritate the skin, because it will not bond to the skin. Unlike rigid acrylic nails, found in nail salons, Keryflex™ is a flexible polymer. The polymerization process bonds the synthetic resin to the nail bed, allowing the formation of a natural edge to be formed at the end of the nail. How long will my new nail last? The interval between applications will vary according to the patient, but in general, the time between applications is six to eight weeks. If for any reason you wish to have the nail removed, our doctors can file away the artificial nail until it is no longer attached to the natural nail.